Research suggests that more than 90% of road accidents are caused by speeders. Even in Singapore, which has the lowest accident rate in the world, this is a big problem. Singapore may have the most safety compliant vehicles and road safety rules, but it cannot control human error. Why am I going on about road safety? Because we are on the highway to wealth creation! But when I talk to new investors, some of them already seem to be looking for the exit ramp. The highway has left many with bumps and bruises. Some are scarred for life. You see, every bull market creates a new breed of investors. In India, less than a tenth of the population thinks of investing in equities. They need a lot of convincing before they invest in equities. It's usually when they see their relatives, friends, and neighbours getting rich with stocks that they take the idea seriously. But what really matters is not when you enter the markets. Instead, it is about how long you stay the course. The newest breed of investors entered Indian stock markets in mid 2014. They had already seen their friends get rich quick in the pre and post-election rally. The promises of Acche Din and the hope of reform coaxed them to try their luck in equities. The next few months were a joyride. New investors found themselves on the highway of quick money. Trading bets, new IPOs, and small stocks were all creating pots of gold...even faster than anticipated. It did not make sense to slow down and consider whether they were on the right track. The highway to wealth creation was full of speeders. Anyone checking their rear view mirror risked falling behind. Everything seemed to be going smoothly for a couple of months. Investors were racing against each other to cross the next milestone. The highway indicators the brokers put out suggested that the next Sensex target was just a few thousand points and few months away...and that investors should lose no time or opportunity to get there as soon as possible. Those months of hectic racing had investors believing they were road warriors. Little did they know the highway ahead was filled with speed bumps and sharp curves. Slowly they realised their speed was not sustainable. The valuations they had paid for stocks were far ahead of their earnings power. The get-rich-quick trading ideas and IPOs with massive listing gains were losing traction. But how could they slow down? That would mean crashing full speed into all the other investors. Besides, they were having too much fun; no one wanted to stop! The China crisis in September 2015 was just the first. And by January 2016, many investors found themselves exactly where they'd started in mid-2014. The wealth they had accumulated racing along the highway for a year had vanished in a month! And with the hopes of Acche Din dwindling, many investors wanted off the highway completely. This is what happens when investors who speed onto the highway of wealth creation without looking both ways. One of their biggest mistakes was never checking the rear view mirror for the core fundamentals of their investments. But what really caused the crash was their greed to cross the next milestone ahead of everyone else. Our advice for these new investors simple. Exiting the highway won't help you achieve your financial goals. Stay the course. But be more careful this time around. Not just when you enter the market select the safest stocks to buy first. But also when you find yourself speeding ahead recklessly do not overpay for popular stocks. A careful ride can get you to your destination. What measures should investors take to stay careful on the highway to wealth creation? Let us know your comments or share your views in the Equitymaster Club. Slowdown in the economy has hit banks hard. In the past six years, bad loans for banks have piled on at the rate of 29% per annum reaching Rs 3 trillion at the end FY15. 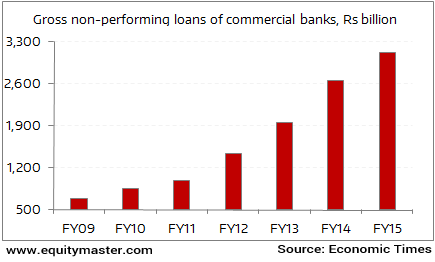 Among banks, public sector banks (PSBs) with a large exposure to infrastructure have been the worst affected. Compared to PSBs, private sector banks are on much sounder footing. At the end of the September 2015 quarter, the level of stressed assets for PSBs stood at 14.1%, much higher than 4.6% for private banks (RBI's Financial Stability Report). Stressed assets are defined as gross non-performing assets plus restructured assets. The jump in stressed assets has not only pulled down the earnings of PSBs but also constrained their growth for want of capital. The recent government's plan to set up a Rs 400 bn National Investment & Infrastructure Fund (NIIF) is likely to provide them with some relief. PSBs can sell off their stressed assets to the fund. NIIF is expected to attract investments from international pension funds and sovereign wealth funds. This fund will not only help banks quickly dispose off bad loans at relatively better valuations but also free up resources to focus on lending. The Reserve Bank of India has set a deadline of March 2017 for banks to clean up their balance sheets. In an era of fast changing technology, established business models have to continuously innovate to avoid becoming extinct. Digital technology has already changed the way items of daily consumption are being increasingly bought and sold on the electronic media. And now with the rapid expansion of car aggregators such as Uber and Ola, the domestic car manufacturers are beginning to feel the pinch. These taxi hailing service operators do not own the fleet of taxis. Instead they act as an intermediary between the drivers and travellers. These services are seeing a pick-up in popularity due to factors such as low cost of ride and convenience of avoiding traffic and parking woes. The cab hiring services can act as potent threat to new car sales. This was a point highlighted while discussing India's Modified Consumption Story at Equitymaster Conference 2016. If you weren't able to attend the Conference, you can get online access to the video recordings of the Equitymaster Conference 2016. Even the regulations governing taxi services have been resolved paving way for their growth in India. A look at the numbers clearly shows that this emerging trend has all the ingredients of disrupting the business models of established car makers. While Ola operates in 102 cities and has over one million booking requests daily, Uber is present in 26 cities. Apart from them, ride-sharing and self-car drive rental services are threatening to impede car ownership in India. Globally, large auto makers like General Motors and Ford have already invested in these emerging technologies. In India, car manufacturers such as Tata Motors and Mahindra & Mahindra are weighing options of entering the area of taxi aggregation service or developing better products to attract consumers. It is clear that they need to make the move quickly to avoid losing out the race particularly when technologically assisted driving can soon become a reality. After opening the day on a green note, Indian equity markets continued to trade firm. At the time of writing, BSE Sensex was trading higher by 190 points and NSE Nifty was trading up by 60 points. Mid cap and small cap stocks found favour too and were trading higher by 1% each. This edition of The 5 Minute WrapUp is authored by Tanushree Banerjee (Research Analyst) and Madhu Gupta (Research Analyst). Will Movie Theatres Exist a Decade from Now? Or will disruption in this sector not be a real concern? Equitymaster requests your view! Post a comment on "Are You on The Highway to Wealth Creation? Be Careful...". Click here! 10 Responses to "Are You on The Highway to Wealth Creation? Be Careful..."
Krishnan Venkatasubbu's comment is naive & assumes that price difference between Chinese & Indian steel is only 10% , hence MIP will result in only 10% loss to Indian economy. If so, Indian manufacturers need to bear a loss of 10% only ( not 100% as assumed by him) to match Chinese prices, which can be easily achieved by government reducing taxes on raw materials, power, taxes for steel Industry. The best way to counter Chinese dumping is to follow the Chinese strategy - reduce cost of production of Indian steel by providing Indian steel companies, cheap loans at low interest, cheap power & reduce taxes on raw materials & excise finished steel excise - till such time this dumping ends. Resulting revenue loss of government can be compensated by higher taxes on Industry, which benefits by cheaper steel. I am big fan of Vivek Kaul. However this is complex world now and so complex business. Upon reading Vivek's article on MIP on steel, first thing came in my mind is that certainly Vivek is not from Business side. He does not understand the market dynamics and complexities under which every buiness man or company works. Pl. note that I am not from steel industry and has no relation with this industry indirectly as well. I am not justifying that what Govt. did is right or wrong. Unfortunately we are all talk about medicines but do not go in root cause and plug the problem. So with short term treatment, we create new problem and then again same story repeats and goes on. This way now we have created sciety or country that has huge number of problems and they are interlinked as well, so solving one will affect others adversely. Our Govt always wants to solve the problems with laws and this is the most ridiculous thing anyone can do as people who are benefited due to problems finds ways and means to overcome these laws and ensure that the problem remains!!! Mahatma Gandhi said if you want to know whether your decision is right or wrong, just check how much it will benefit to the poorest person in your society / country. I have a different view on the topic of Whether the Govt to interfere in fixing the MIP and support the steel industry. While the consumer and other industries are affected only by the price difference , say around 10 percent, the indian economy and GDP will lose the entire 100 % by importing the steel and denying the domestic steel manufacturer the opportunity to produce that steel. The MIP intervention in not unfair especially when the countries like China are supporting their steel industry in so many ways like fixing their currencies, extending undue financial support etc., Of course the Govt has to look at how to insulate the Engg goods export companies from the price increase due to MIP. How ever question is , people who chose to ride on side lanes @ slow and steady , Have they reached any where? With market loosing Modi premium and big guns not going anywhere as a matter of fact lot of them have tumbled only in last 18 months , i feel even value investor following EM advice too is no better. EM services of Value pro, hallmark of value investing is example of that ? While we as investor are sold sagas of long term investing , time in market rather then timing the market , what works to get medium term view of market right and then working accordingly.Any vehement objections? Investors should keep in mind that they are travelling on hightway with great speed. Hence risk is very high either they will reach early or will lose their life. Hence it is better to take sideway on highway with moderate speed as Deri se Pahuchna as it is like Durghana ko hatana. Therefore my advice to investors will be to keep update with all the news whether local or global affecting their investment portfolio and drive with moderate speed of 60 to 70 kmph rather than at the speed of 100 to 120 kmph. T BANERJEE MADAM ,GOOD EVENING,YOUR TODAY'S ARTICLE IS HEART TOUCHING.I AM THE VICTIM OF THIS SPEED.I REALIZED THE SAME AT TODAY'S THIS POINT OF TIME .NOW I DECIDED TO FOLLOW UP 200%ADVICE THAT EQUITY MASTER SHARE WITH US.TRULY, IT OPENED MY EYES TODAY.I AM THE VICTIM OF THIS SPEED.